Estimating the cost to America of damage from climate change in the 21st century | Climate Etc. by Larry Kummer, originally posted at the Fabius Maximus website. Another peer-reviewed paper predicting disaster from climate change by misrepresenting and exaggerating the science. We can still learn much from it. By Solomon Hsiang et al in Science, 3 June 2017. “Estimates of climate change damage are central to the design of climate policies. Here, we develop a flexible architecture for computing damages that integrates climate science, econometric analyses, and process models. We use this approach to construct spatially explicit, probabilistic, and empirically derived estimates of economic damage in the United States from climate change. We start with the abstract, dry language for bombshell conclusions. Then we examine the assumptions and conclusions that mainstream journalists gloss over. The press coverage was enthusiastic, even fawning. Reading closely brings out some odd aspects of the reporting. For example, Seth Borenstein’s AP story gave a quote demonstrating a rule about climate change stories: omitted factors can only make the effect of warming worse, never less. This is a subset of the master narrative for news articles about climate change: its effects are only bad. Good effects, such improved plant activity from fertilization by higher CO2 levels, must be ignored. Another rule in the master narrative: the only true experts are those writing about extreme adverse effects of warming. No matter how eminent, anyone speaking otherwise is bogus. — Tweet by Gernot Wagner, economist at Harvard and the Environmental Defense Fund (bio here). But the more interesting aspects of the paper are its description of RCP8.5 as a “business as usual” scenario — and the reactions of some scientists to its methodology and conclusions. This is another in the long series of papers I’ve documented that are Manufacturing climate nightmares: misusing science to create horrific predictions. What a disgrace that statements like these in this paper survive peer review in a major journal (red emphasis added). The latter statement is scientific-sounding nonsense. The RCP8.5 scenario is also consistent with our sun going nova. That is not a useful description of the worst-case scenario given in AR5. The description of RCP8.5 as “business as usual” is a common misrepresentation. RCP8.5. is the worst-case of the four scenarios used in the IPCC’s AR5 report. Neither AR5 nor the paper describing RCP8.5 call it a “business as usual” scenario, because it is not. Such a scenario would assume continuation of existing trends through 2100. A worst-case scenario assumes trends change for the worse. RCP8.5 assumes population growth at the 90th percentile of the probability forecast for 2100 (i.e., not considering real-world factors) and near-stagnation of technological progress. The almost universal trend of falling fertility with development makes the former unlikely. People assumed that a fundamentalist Islamic theocracy would keep Iran’s fertility high. It was 7 in 1960 and still 6.5 in 1982. By 2014 it had fallen to 1.7 — below replacement level. See this for more about the unlikely RCP8.5 scenario. See this for the long history of misrepresenting RCP8.5. Richard Tol, professor of economics at U Sussex, gave a brief critique of the paper to the Daily Caller. Roger Pielke Jr. (environmental studies program, U CO-Boulder) provided this comment to Seth Borenstein of the AP (who, of course, quoted only those making alarming statements). “I point you to this paper’s bottom line conclusion (which is similar to Stern’s): “Our market estimates are for a 1.0 to 3.0% loss of annual national average GDP under RCP8.5 at the end of the century.” US GDP in 2015 was ~$18 trillion. In 2100 at 2% annual GDP growth it will be ~$97 trillion. Under the scenario presented in this paper it will be $94 trillion. “Thus, this paper confirms what past studies have already told us – climate change is real and, under various assumptions for how the future will play out, may indeed have meaningful economic impacts. On the one hand, 3% of 2100 GDP is a big number, on the other hand under this same scenario, GDP is still expected to increase by >500%. Roger Pielke Sr. (bio) repeatedly points to the elephant in the room about these papers — the ignored assumption that climate models’ predictions about global climate (when fed accurate predictions about emissions) are a sufficiently skillful basis for public policy — and that downscaling these models produces regional forecasts also useful for making public policy. There is little evidence of either. See here for a discussion of the literature about model validation (see the end section here for links to the literature). He says there is even less evidence for their skill at regional levels. He reviewed the literature validating regional downsizing five years ago, and relatively little progress has been made since then. Climate change is real and a serious problem. But the campaign to warn the public has been incompetently done, failing to provide the transparency and level of evidence proportional to the magnitude of the solutions proposed (details here). This paper adds to two decades of examples. The politicization of science has helped neither the processes of science or politics. The result has left America vulnerable to even the inevitable repeat of past weather, let alone future climate change. Climate change is not a “real and serious problem.” Nor are speculative computer models science. There is no testatable hypothesis here and no observational report. Politically motivated speculative modeling has simply taken over the field. See https://www.cato.org/blog/climate-modeling-dominates-climate-science. But you say none of this. Tepid criticism supports the underlying fallacy. This is a1,600 word review article (long as such things go), making specific criticisms of a single paper, written for a general audience. It’s neither a statement of the Cosmic All nor a rebuttal to the IPCC. Accurately: “Climate change caused by man may or may not be a problem. We simply do not know” Your conclusion is conjecture, not fact. I know of no climate or environmental scientists who does not regard climate change as a problem. Their debate is about its magnitude and timing — which influences the associated public policy about what measures (if any) to take in response. So it is a conjecture, but tend most things we deal with in life are conjectures. Consensus does not equal proof. Not surprised the environmental community has trouble with logic-and-reason. Requires a lot of sound reasoning and the ability to recognize when you are in not position to draw a conclusion. Also requires courage to stand-up against the “politically-correct” mob and tell them to back-off. Also means not forcing the poor and middle class to fund the elitists who do not have to bear the financial brunt of what is fundamentally a religious crusade. Of course it is testable. In princple. We cannot test the impact of a super volcano eruption at will. But predictions about them are testable in principle. The language can be cool calm collected, but the main points must be firmly made:- The study has obvious misrepresentations. The models are not fit for purpose. Climate is not following the script, and risks are clearly lower than stated. Benefits were ignored. Global cooling is a risk that should be considered too. And so on. The main points were not made. Tepid criticism indeed. A standard way to estimate a damage in a slowly changing environment is to extrapolate past damages. Where can I find a list of actually incurred climate-change-damages for years 2000-2016? That would be an extremely poor way to do it. We are pushing new limits and damage occurs in ways it hasn’t before except as 1 in 500 year events. Look at 1 in 500 year events to increase to 1 in 10 years for example, and that gives you some idea. Let’s just assume the 500 year event occurs every 10 years! This is precisely how ridiculous the alarmist speculation has become. Free and easy, no laborious science needed. No wonder it dominates the literature. The odds change in a rapidly shifting climate. In a normal distribution a shift of 1.5 standard deviations makes a 500 year event into a 10 year event. Climate metrics are shifting from 1951-1980 levels (Hansen’s climate dice paper), some by this much, such as summer mean temperature, just in the next few decades. One thing that is happening very predictably is the encroachment into new extremes. For what its worth I appreciate your contribution here even though we rarely agree. The 1 in 500 year events really does not have any validity. ATTP has been running a thread on heat waves on which the russian one of 2010 came up as an example of exceptional change. I am weary enough here of pointing out this sort of fallacy, let alone doing it over there as well, but in that case, just in the 19th century there were some 12 very severe Russian heat waves, where forest combusted and peat bogs smouldered, crops died and thousands perished from flame and hunger. It is very rare for any of these things to be unusual, let alone exceptional 1 in 500 year events, but it is only if you closely examine say a thousand years of records,as I do with Britain (and Europe to a lesser extent) that you can see that todays climate is relatively benign although extreme events can happen even in benign times. If we assume that at some point the extremes of the future could be as extreme as the weather of the past, that will be a good starting point for taking action. To do that we need to know what the extremes and the general weather of the past was like, but, as I have found, telling people often brings howls of protest. Thanks. The message is what used to be rare won’t be going forwards. We are impacting the odds in significant ways. Increased frequency makes the difference between bothering to rebuild or not after these events. Yes climate reason, ATTP’s post attracted some rather silly comments. I don’t understand how mammals could have survived for 100 million years given the supposedly fatal wet bulb temperatures quoted by ATTP. I have seen it argued that generally, mammals were adapted for nighttime activity because it was cooler. It is a tired and well worn pathway to assume no easy adaptation can or will occur. Generally, all this seems to me to be so easily exaggerated that it is wise to just ignore it. Arguing that disaster is just around the corner is a tactic as old as human civilization. Usually those predictions of disaster are exaggerated or worse being used for dishonest selling of the “solution” to the predicted disaster. In the case of climate change, its such an all pervasive theme in media, one constantly has to check one’s tendency to attribute any extreme weather event to it. This is another well worn path. Any event that is in any way bad must be due to the witch currently at the top of the list of theological scapegoats. Effectively dealing with an problem can then be avoided. I just go on steadily accumulating references to past weather events and sometimes cite them when the audience is likely to be receptive or interested. The 2010 Russian heat wave ignores the vast amount of Russian literature relating to extreme events, hot and cold. OK, let’s look at 1 in 500 year events. The Little Ice Age (LIA), for example. Famine, plague, witch hunts – not a nice time. Will global warming reduce the possibility of another LIA? If so, that would be an excellent benefit. Wouldn’t it? The reduction of 1 in 500 year events is barely noticeable and not as consequential as their increase to 1 in 10 year events. Jim D – Now I get it. The bad 1 in 500 year events that you pick will increase to 1 in 10 year events, but the bad 1 in 500 year events that others (like me) pick will not increase to 1 in 10 year events. What a neat theory. Has it been tested? Your example was a cold event. Rare hot events increase, rare cold events decrease. I am not saying anything that should be surprising here. It’s far more useful to look at such predictions from an ecclesiastical perspective because logic and science won’t apply. Gaia is an angry and jealous god who doesn’t respond to sin by distributing harms and benefits evenly. Dry places will become dryer. Wet places will become even wetter. Cold places will become worse, depending on whether getting colder or getting warmer would constitute worse, as Gaia chooses on a case by case basis. It’s all about suffering because we have displeased her. Mike, listen to George. He has some interesting ideas that you can ask him about if you don’t like my answer. Or possibly, as I have pointed out before, both hot and cold events decrease. Wanna see the bias of the IPCC? 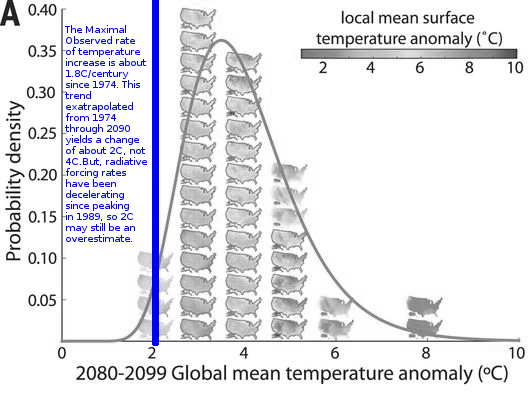 In IPCC AR5, Figure 1-08, the IPCC considers changes in mean and variability. They consider increase in mean, increase in variability, and increase in both. What’s missing? The IPCC doesn’t even include the possibility of increase in mean with decrease in variability! Why is that a scientific problem? Because the GCMs, physical arguments indicate a decrease of variability with global warming. And the century length records indicate a decrease of both high and low temperature extremes. 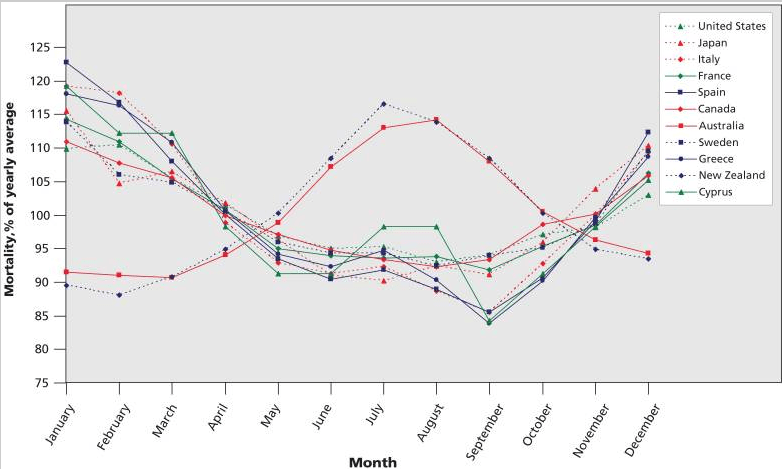 A decrease in daily variability is not a decrease in seasonal variability. Seasonal variability could increase because of blocking patterns being established longer in some years making them hot outliers. Heatwaves come from these. If you look at the hottest years, I would bet they had less daily variability because of established blocking patterns that give days on end of hot temperatures. Less variability is not a good thing in mid summer. Re: ATTP’s heat wave post, look carefully at the “deadly hate wave chart”. It says that a temperature in the mid-80’s F and 60-70% relative humidity produces lethal events. I don’t doubt that someone has died in this weather but it has to be a very rare event and likely complicated by other factors. This chart is agw propaganda on its face. I live in eastern NC, am 73 years old and I regularly walk 9 holes of golf or ride 18 in these conditions and worse. Yes it’s hot but lethal it ain’t. Look further up the chart and see what conditions they describe as lethal. Even conditions in the high 70’s and rh’s in the 60’s are defined as lethal events. This foolishness doesn’t even come close to passing a common sense test. For pointing this out, and using the word “catastrophic”, I was threatened with deletion. ATTP also wanted me to take an agw litmus test to gain the privilege of further participation. I know this sounds crazy but look at the article and scan through the comments. Using RCP 8.5 as “bus as usual” falls into the same category. This kind of stuff give every consensus enforcer on the planet another opportunity sound off. Another example of agw propaganda. This is not overstatement – look up the word. OOPs. “heat wave” chart rather than “hate wave”. I live in eastern NC, am 73 years old and I regularly walk 9 holes of golf or ride 18 in these conditions and worse. Yes, I have a friend who grew up in Indiana, moved to Alaksa, then retired to Phoenix where he golfed year round. I’m not sure where he was supposed to have died, but he certainly induced far more climate change on himself by moving than CO2 ever will and every move was to his benefit. This perspective gets lost by the hyper-ventilators. Less variability is not a good thing in mid summer. 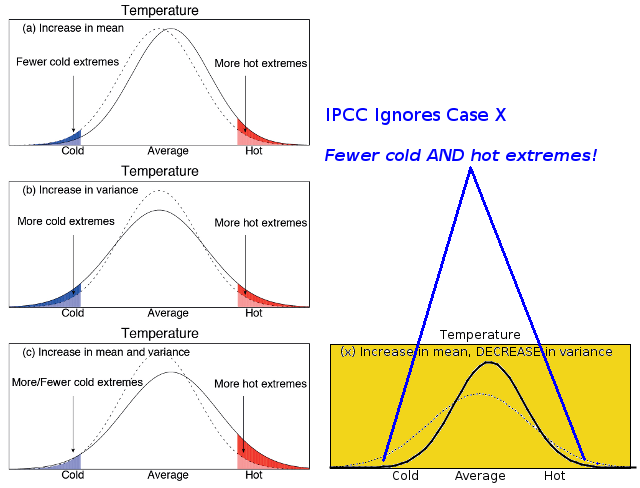 Less variability means fewer hot extremes, something you and the IPCC appear to be in denial of. Heatwaves have almost no variability within them. They last days to weeks and often include no rain. Are you ignoring these? The damage comes from prolonged events, not a single outlier day at 100 F. Saying less variability equals less harm is fundamentally flawed. I could not help but to reply to the 500 year floods in 10 years. First of all, this is a probability statement. It means that every year there is a 1 in 500 chance that a flood will occur that has the ability to cover a land area that is up to the 500 year flood plane level. The probability does not change if there are two 500 year floods in 10 years. Those years may indeed represent unlucky years, or the 500 year flood plane determination could be wrong, or it could be due to climate change. The problem with the 500 year flood plane concept is that the basis for that determination is based on estimates made by scientists concerning historical flood data. When direct observations and personal accounts and direct evidence are not available, the determination must come from geological investigations. If the geologist is wrong, then the 500 year flood plane determination is wrong. Importantly, since climate is always changing due to many different factors, if the estimating geologist doesn’t account for climate variability, and other factors related to the region being studied, then what may have normally been a 10 year flood may have been classified as a 500 year flood. The problem is that the age of ancient and geologically historical floods can be difficult to pinpoint precisely in time, and therefore, the error bars for these types of flood occurrence rates may be large. Generally, it depends on a whole bunch of factors related to climate/weather in the region, overburden deposition rates, geological structures, temporal epoch, etc. How far back in time do you go geologically to estimate a 500 year flood plane statistically; 500, 1,000, 2,000, 5,000, 10,000 years? 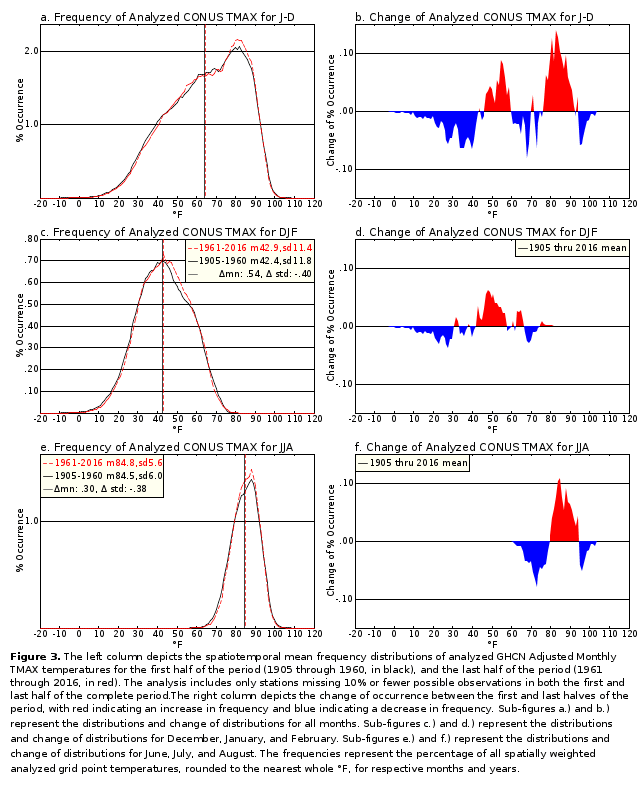 How does the climate variability over those time frames affect the statistics? Really, all this means is that the people who determined what the extents of a 500 year flood plane is may have been wrong in the calculation/estimate. How wrong? I don’t know. But then again, maybe the recent flooding is due to climate change. How do you parse out being unlucky from actual cause and effect for such types of flooding? Claims of excessive 500 year flooding show a clear lack of understanding of what a 500 year flood plane determination actually means, how it’s derived, and how to use it. We may indeed have a climate change induced flooding problem, but until event statistics are significant enough (higher temporal frequency over a significant amount of time) to change the present status of the determination, we can only assume that the determining geologist is correct, and those locations and events are truly unlucky. If you are considering measurements at a single point that is a problem. If many regions of the US independently have 500 year events above the rate expected, that starts to become significant. The statistics would be more robust with seasonal temperatures than with precipitation for sure because precipitation has a lot more interannual variability. Heatwaves have almost no variability within them. 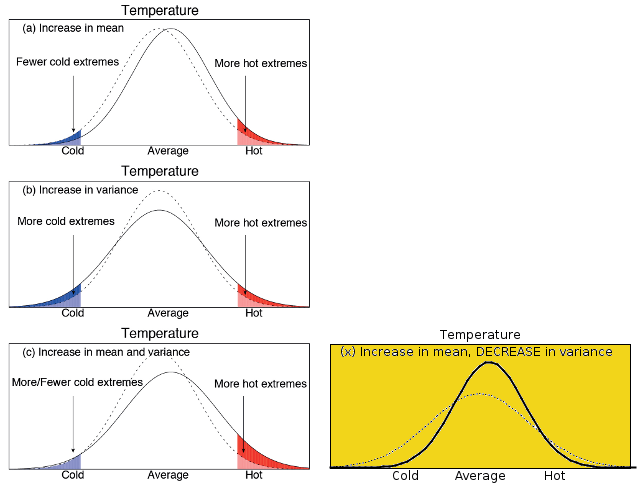 Heatwaves statistically represent variability, so decreased variability would mean fewer heatwaves to begin with, irrespective of variability during the heatwave. They last days to weeks and often include no rain. Are you ignoring these? Of course, heatwaves and droughts are co-incident. The same subsidence which inhibits precipitation also yields the increased sunshine, compressional warming, and reduced mixing of heatwaves. 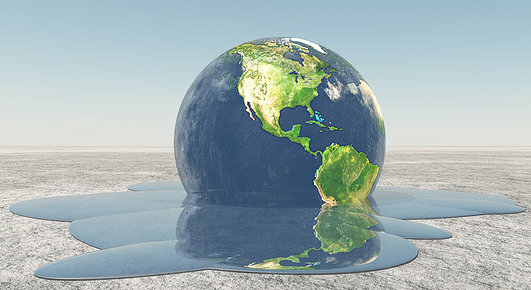 Further, as Manabe pointed out, the amount of energy transported by the atmosphere required to balance the energy deficit of the poles would be reduced with global warming. This means less extreme temperature variance induced by motion, since less motion is necessary. OK, so how do you define variability? 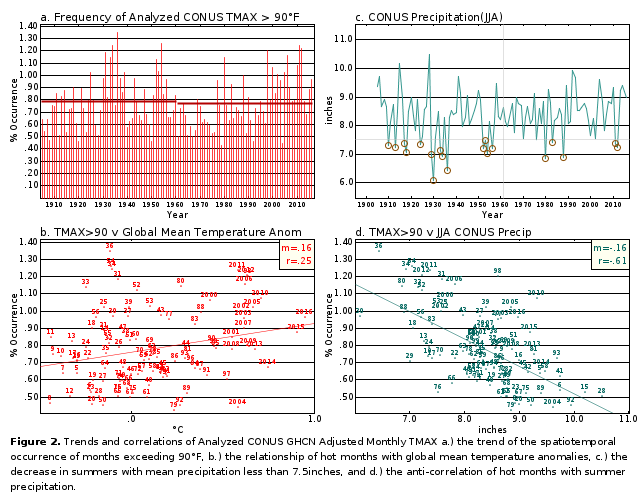 Variability in the seasonal average temperature or daily variability? Weather systems seemed to be your focus before which is daily variability. A heatwave by definition is a variation over a longer period, i.e. lack of moving weather systems, and a completely different thing. Conflating variability time scales causes confusion because long-term heatwaves are more likely when weather variability decreases. I will also add this that looks at seasonal temperatures on a more fine-grained decadal scale than the one you linked. Yes, that appears correct in the shorter term. In the longer term, extremes have decreased. Confirmation bias is ignoring some data which contradicts one’s thesis. Of course, observation bias means focusing on what one can observe to in the context of what one doesn’t observe. 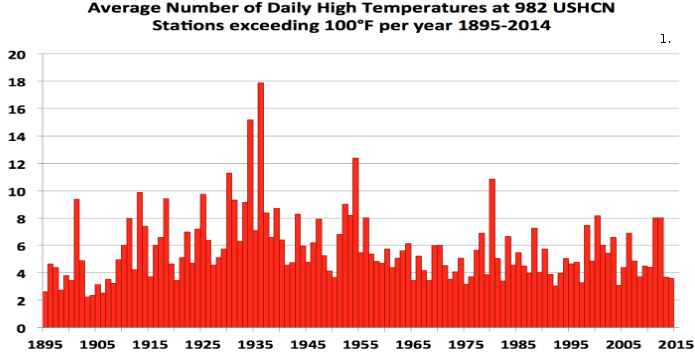 So we don’t know so well what happened before 1905, but we know that since then, extreme temperatures have decreased. The short term includes about 75% of the climate change. We need to focus on the rapidly trending part, and a lot of the broadening is dominated by the trend itself. The signal is very clear when it is not averaged out over 60 years. it is at least consistent with the theory that mean increase causes extreme decrease. Nope. The data shows otherwise. Extremes move right along with the mean at least at the same pace. Hansen demonstrated that with the increased frequency of what were 3-sigma hot summers in his baseline 1951-1980 climate. The dominant factor is the shift of the mean, not the change of the shape, if any. You are ignoring the data since 1905 in favor of shorter term data which supports your thesis. That’s what confirmation bias is. The short term data is where the climate change is. Like I said, 75% of the change has been since 1950. Before that it would be harder to detect the signal of its effect against the noise of natural variations being a trend of less than 0.01 W/m2/yr. More recently its trend has grown steadily to 0.03 W/m2 per year resulting in a sharp rise in temperature and a strong signal to noise ratio. No Jim, the lesson is you have no idea of what you are talking about. Your interpretation of a 1 in 500 year event or any other length of period is juvenile. As usual, turn to NOAA for the answer! Here is a historical table of U.S. billion-dollar disaster events, summaries, report links and statistics for the 1980–2017 period of record. Thanks, Editor. How do I attribute any of them to climate change? Probably easily, a billion-dollar event can’t be caused by anything else than a climate change. I just saw a report on a French channel tv5monde.com which attributed monsoon rains in China to climate change. Thanks for the link. My reaction after reading the list of $1 Billion damage events was, so what. Setting aside the obvious issue of adjusting for inflation for any other 37 year period there is still the challenge of controlling for the vast amount of changes that the US has undergone in the last 200 years. If this report is to somehow show effects of climate change then there needs to be a comparative analysis from pre AGW periods. If we choose the period 1863 to 1900 as an example, how do we control for the millions of homes, barns, businesses, bridges and autos that didn’t exist then. Or the millions of acres of farmland and fruit trees or any number of ways that monetary damages today are exponentially larger than in the 19th century from exactly the same natural variability weather events that have been going on for thousands of years. The NOAA document is fine to produce scare tactics but to prove anything about AGW it is worthless. That is, of course, the bingo question. Attribution of causes to events often ranges from difficult to impossible. Roger Pielke Jr. was smeared and vilified for pointing out facts similar to those you cite, such as that damages as a fraction of GDP have been stable or declining. Such facts are doubleplusungood, and must be put down the memory hole — to save the narrative! And what is important and relevant is whether the cost of the weather related events, as %GDP, will increase or decrease if the climate gets milder, and the planet moves out of the current extreme ice house phase in millions or tens of millions of years from now and moves back toward its average temperature – where life thrives and the cold and warm cycles are less severe. So much to look forward to in tens of millions of years. In fact, our ancestors will be able to step from Australia to China in 60 million years. Think of the savings in jet fuel, Jimmy D should be pleased with that bit. Please ignore the last comment – I completely misread the legend on the NOAA chart and so the numbers are completely wrong. I’ve downloaded the raw data instead and merged with Bureau of Economic Analysis ‘Real GDP’ figures (easier to download than IMF data). I’m afraid I don’t have the means to upload this table in graphical form, but I can’t discern a pattern or trend when I chart it. Why do you put “answer” in scare quotes. NOAA gave the data. It confirms the analysis of most who have looked at it (e.g., the IPCC, Prof Pielke Jr.). The data contradicts the climate alarmists, but that’s nothing new. Please disregard my last comment on your last comment, per your comment to disregard your last comment! We need a delete feature for comment threads! The damage being done is in the alarmism (and the associated waste of money & resources) & the gutting of proper science. Florida’s dirty little secret is that the state’s economy benefits greatly from all of the infusions of cash in the form of hurricane disaster relief. Nothing to do with being the result of human-caused global warming though. Economists call that the Broken Window Fallacy. Emphasis on “fallacy”. Assuming it were even possible to calculate the opportunity cost of rebuilding New Orleans, what would the political cost have been to say, Hey– it makes no sense to spend taxpayer money to rebuild a city that is eight feet below sea level. Politics aside, soccer moms driving SUVs didn’t cause Hurricane Katrina. Many years ago a friend from New Orleans told me a story about a bridge construction. They built from both sides and in the middle they missed each other by a foot. I said, John, it is difficult to believe, are you sure it was a bridge, not a tunnel? John said, you don’t know New Orleans. Florida benefits from tourists. Everything else is on the margins. Florida benefits big time from retirees and “snow birds”. 350 years to double CO2 and a TCR of 1.4C. Nothing notices a 1.4C change in 350 years. Not human, not animals … nothing. Approved by Michael Mann? That is an indication we’re being served up a heaping load of Mann/Gore faux-science. Michael Mann’s hockey stick science and Al Gore’s vision of Earth-destroying runaway global warming has been thoroughly debunked. It has all been the product of a knowing and purposeful deception– a scientific fraud. The illusion of certitude and the tyranny of immediacy is the real hoax! Perhaps science can fix itself over the next eight years but it will be a long slow process– Western academia now has the credibility of CNN. Agreed. The quoted words from Mosher at the end of the article are interesting icing on the cake. The End is always just around the corner. Repent, Sinners!, Repent!!! I predict this doesn’t scare anybody. It’s just the same old song. This campaign has been running in the US since Hansen’s 1988 Senate testimony. As you note, it has failed to make fighting climate change a high priority of most Americans (i.e., ranked vs. the many other national public policy needs). But don’t declare a winner until the game is over. The campaigns failure results largely from Nature. No sufficiently large weather events hitting Europe or North America. A few more years of that SW US drought, a few more big hurricanes hitting cities — how much would it take to panic Americans into making climate change a high priority? The campaign’s model is, roughly speaking, that used by the Truman administration to start the Cold War. It can still win. — — Senator Arthur Vandenberg’s advice to Truman about starting the Cold War. Truman did so in his famous speech on 12 March 1947. From Put yourself in Marshall’s place by James Warburg (he helped develop the US WWII propaganda programs). I would guess that it is mostly non-economists who take these studies earnest. Economists know better. Figure 1A: RCP 8.5 scenario – Why? Mean temperature change to 2090 around 4C. Actual observed warming rates around 1.2C. Figure 1B: meaningless ‘weather’ forecast for fourth of July, 2090 – didn’t get the basic education that weather isn’t predictable past a week or so? Figure 1C&D: No comparison with actual increasing crop yields? 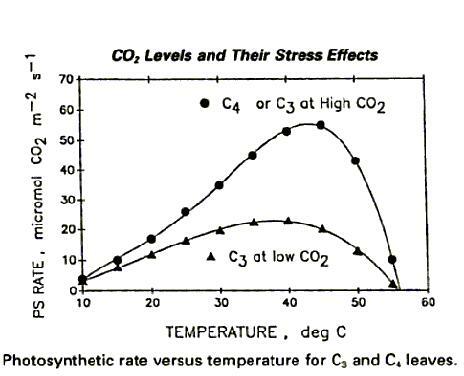 No acknowledgment of the increase in the temperature of optimal photosynthesis in an increased CO2 environment? Figure 1H: is interesting and accurate, but misleading. Air conditioners run on electricity while heat comes from coal/oil/natural gas and least effectively or commonly on electricity. Electricity us increases with summer’s heat, but total energy use increases even more during winter’s cold. Gullible press and public, and cynical science media, for shame. What exactly is a probability density? Or just jump in and have fun. For evidence, just look at the big jump in the divorce rates since the cool period of the 1960’s and 70’s. Obviously that’s due to man-made climate change. Even though there’s no hard data showing a link between climate and incidents of spontaneous human combustion, you just know they have to be linked, so let’s toss that in too, since people naturally fear bursting into flames. It’s pretty much an alarmist trope at this point anyway. I’ve seen plenty of garbage science, but garbage is too generous a term for the study. Garbage implies a collection of things that were, at one time, useful. This is more like sewage or toxic mine tailings. ENSO is a good indicator of global extremes in floods, droughts, cyclones and temperature. The effects leave traces globally that are interpreted as high resolution proxies. Moy et al (2002) present the record of sedimentation shown below which is strongly influenced by ENSO variability. It is based on the presence of greater and less red sediment in a lake core. More sedimentation is associated with El Niño. It has continuous high resolution coverage over 12,000 years. 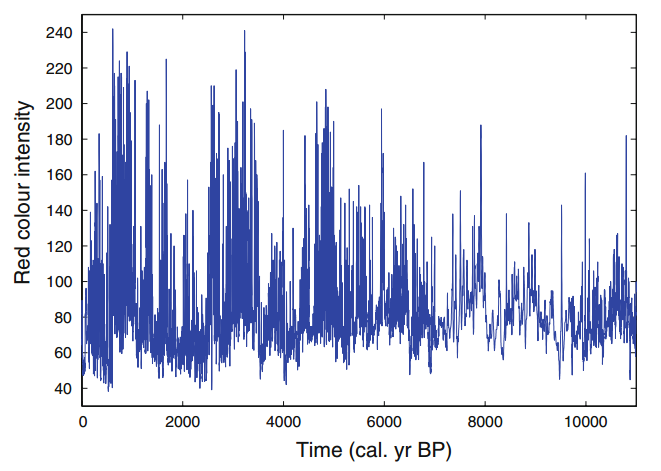 It shows periods of high and low El Nino activity alternating with a period of about 2,000 years. There was a shift from La Niña dominance to El Niño dominance that was identified by Tsonis 2009 as a chaotic bifurcation – and is associated with the drying of the Sahel. There is a period around 3,500 years ago of high El Niño intensity associated with the demise of the Minoan civilisation (Tsonis et al, 2010). Red intensity during the Minoan decline was regularly in excess of 200. For comparison – red intensity in the 1998/99 El Niño was 99. It shows ENSO variability considerably in excess of that seen in the modern period. There is no evidence here that 20th century extremes are outside of the limits of natural variability. The future is much more uncertain. This is a perturbed physic ensemble – one that is constrained to approximate recent temperature observations. The multiple non-unique solutions arise from sensitive dependence to initial conditions – the chaotic core of climate models. I find it perplexing that they have forgotten Edward Lorenz so soon. The question is which non-unique solution is the right one? Possibly none – and there is no explicit method of choosing rationally. Solutions are chosen on the basis of qualitative expectations of global warming – and utilized by the IPCC in their opportunistic ensembles. A seemingly theoretically unsatisfactory practice enthusiastically bought into by mathematically naive global warming enthusiasts. The thick black line is my addition which uses the ambitious method of a straight line and eyeballing. The rate of 20th century temperature increase is 0.09K/decade. There is some internal variability in there – which we seem likely to lose this century. And we are likely to do much better than the mid-range no mitigation scenario used by Rowlands et al. It all seems a bit imponderable. I have suggested that a formal risk assessment is a better option than half arsed social cost assessments based on uncertain assumptions. Risk in the technical sense is the product of consequences and probability. Uncertainty is a theme at CE – albeit acknowledged grudgingly. There is a low probability of high impact events – something that – as a climate catastrophist in the sense of Rene Thom – I would define as extreme risk. It does not require an impossible certainty but feasible scenarios and realistic estimates of probabilities. A risk assessment is a very broad ranging methodology. It might include for instance water stress in a specific area – with defined consequences such as on biodiversity, fire, security or civil society – at either global or regional scales or both. And a defined probability of occurrence. You describe the event, determine consequences and assign a probability. It is avowedly subjective – but that’s part of the charm. You can even crowd source it. Loehle, C. 2017. Epistemological Status of General Circulation Models. Climate Dynamics DOI 10.1007/s00382-017-3737-7. Thank you for the pointer to this valuable article! “The epistemological status of general circulation models” by Craig Loehle, Climate Dynamics, in press. “Forecasts of both likely anthropogenic effects on climate and consequent effects on nature and society are based on large, complex software tools called general circulation models (GCMs). Forecasts generated by GCMs have been used extensively in policy decisions related to climate change. However, the relation between underlying physical theories and results produced by GCMs is unclear. “In the case of GCMs, many discretizations and approximations are made, and simulating Earth system processes is far from simple and currently leads to some results with unknown energy balance implications. Statistical testing of GCM forecasts for degree of agreement with data would facilitate assessment of fitness for use. If model results need to be put on an anomaly basis due to model bias, then both visual and quantitative measures of model fit depend strongly on the reference period used for normalization, making testing problematic. It doesn’t get to the core of chaos. I commented on the epistemic status of models days ago – albeit somewhat flippantly. Here’s a couple of papers by leaders in the field. It seems a difficult idea. Thank you for the link to that interesting paper. It’s from 2007. I wonder if there has been much follow-up work on its insights, from the author or others. You posted the same link twice (not two papers). We have had plenty of bad weather events since 1988. I don’t doubt that folks could be scared by a series of unusually frequent catastrophic events. Do you have any reason to believe that it’s going to get significantly nastier in the near future? Truman did not start the Cold War. The expansionist Soviet Union was clearly a bad actor and a clear and present danger. Truman reacted to that reality. In some ways, yes. The extraordinary lack of severe landfalling hurricanes is likely to end. More broadly, we (US and EU) have had a run of good luck. Luck changes. Weather is random. The people who were there disagree with you. There were responses other than the massive “Cold War” military response, with its exaggerations of the Soviet threat, its bogus “bomber gap” and “missile gap”, etc. It is a close parallel with climate change. In both cases there was/is a real threat, but the response relied on propaganda rather than a realistic fact-based description of the threat and evaluation of possible responses. Luck? It’s due to run out? Very scientific. Truman did not start the Cold War. It started in 1917. We had a temporary detente with Stalin, after his partner in war crimes turned on him. If anything, Truman’s push back was tardy and weak. Talk to the people of the Soviet’s captive nations. Ask the American’s and allies who survived the Korean and Vietnam proxy wars. They tried to take over the freaking world. You have been studying left wing revisionist history. I assume you’re trolling us. I was referring to one of the most powerful forces in the world — things return to the mean. Lessons are held daily in Las Vegas to educate non-believers. They are open admission but not free. They love your type in Las Vegas, fab. The clowns with pencil and paper writing down the numbers that turn up on the roulette wheel. They watch red come up 10 times in a row, then bet on the black. It’s overdue. Oooops! Don’t you remember that you just said that weather is random? Do you know what random means? No serial correlation. Look it up. I have no idea what you are replying to. You appear to have made up a bunch of stuff and attributed it to me. I said “The extraordinary lack of severe landfalling hurricanes is likely to end.” I referred to “return to the mean”. If you wish to give a rebuttal to either statement, I’ll be interested to read it. Whatever the intentions of the Soviet Union, their capacity to take over the world never really existed. There are valid arguments for claiming the US overestimated the threat. Research the basis for US strategic nuclear policy. Referred to as “bootstrapping”. When evaluating Russians it is always good to remember that paranoia is ingrained in their psyche. Who would or could have stopped them except us, tim? How do you overestimate the threat of a nuclear power with Joe Stalin as leader and the capability of destroying the entire planet? Little North Korea worries me a lot, tim. They are a Soviet creature. As is Red freaking China. They were trying to kill us all over the world. Looking back in hindsight, after we beat them, and saying we overestimated is just plain silly. What were our people with national security responsibility supposed to think, when the rest of the world disarms after WWII, but the expansionist USSR spends a lot of scarce resources on building 100 airborne divisions and tens of thousands of tanks and mechanized armored infantry vehicles? Self-freaking defense? Tell us how many subs they built to project their power, tim. I am surprised at you. How much time did you spend under water? Do you think that weather knows it has shortchanged us on hurricanes and needs to catch up? In other words get busy reverting to the mean? Do you think weather has a schedule for staying on mean? What makes you think it is about to revert? Weather has no memory, fabby. And no conscience. Weather doesn’t feel it owes us anything. You fundamentally don’t know what you are talking about. There’s always a range with climate change, both globally and in the US, between those who pay and those who benefit. HuffPo focuses the north-south disparity here. On NPR today, there was an item about Georgia peaches being in trouble because they need a certain number of cool winter nights, and the last couple of years they didn’t have sufficient. These little things add up. Globally the range is even larger. There are major costs in some areas. There is an interactive map with the article so you can see how the number of days greater than 95 F changes with time and scenario, for example. Quick, call the cannabis farmers. They will breed you a peach tree that will thrive almost anywhere. Plants like it when we love them. Truly, high temperatures are devastating to plants. Pretty much everything except the maple syrup is from Florida, California, and Mexico. Why are all the plants growing along the equator and not in the arctic? Examples of things not grown at the equator: staple veggies, grains, meat. All you’ve got there is fruit and more insects than you know what to do with. Um, have you ever looked at tropical farming? Take Indonesia. It produces massive quantities of rice, corn, cassava, sweet potato, cabbage, mustard greens, sugar, and coffee. It is on the equator. It is a breadbasket. Brazil produces 8 or 9 times as much beef as all of Canada and more than all the EU countries combined. Mexico produces more beef than Russia. OK, so you want to clear the tropical forests and replace them with cash crops. This may be another area of difference of opinion. Well, admittedly, letting people in the tropics grow food does interfere with the plan to clear cut all the tropical forests to produce renewable energy in the form of wood pellets that can be shipped to the EU so Europe meets their Paris climate goals. But the point is that the range of plants we can grow goes up with temperature, not down. The entire climate zone growing map, as seen on the back of every seed packet, is drawn according to the lowest winter temperatures or the frost dates. High temps don’t even figure in. There are a few plants that time some part of their life cycle on a required cold period, such as tulip bulbs, and some plants like tomatoes can have trouble setting fruit during very hot days, but by and large, warmer is far better. Thus California and Florida lead the nation in tomato production, even though Ohio is number four and New York is way up there. Canada grows a lot of wheat, but so do Mexico, Brazil, and Egypt. Corn, that staple northern crop, was invented in Mexico and Brazil is the #3 producer. There’s a reason that agriculture uses a lot of greenhouses. Subtropical areas like the Mediterranean and Mexico, Texas or California could get more arid, in which case the extra heat is not a good thing to have. That is the other factor in climate change. I suppose it’s about water. Mexico seems to handle that. Training camp in Mankato, Minnesota. Costa Rica is a beef producing country Jim D.
Thanks very much. I did not know that. Interesting stuff. Growing tips: cherries need a cold climate and well-drained soil. The best time to plant them is in winter, when they are bare-rooted. Jim, where does your authority come from about this range that always happens with climate change? Do you, for example, have some examples of previous climate changes which always delivered a range of some sort? Or are you just throwing it out there hoping you can just skate straight past the need for some kind of evidence? I just read the linked paper to see that. You apparently didn’t. There’s winners and losers in climate change, both in the US and globally. If you don’t want to read the paper, check out the HuffPo summary. Not sure what got you so disgruntled, I will ignore it. All I said was the seemingly uncontroversial statement that climate change has a range of effects from beneficial to harmful depending where you are. This was just summarizing the Science paper where northern states got the benefit while the southeast suffered. Maybe you would summarize it some other way, but you were not forthcoming on that, so we are left with my statement that I just repeated. It’s the part you quoted. Are we into mind-reading again? What are you talking about? Matthew Kahn has a different view why not to trust this paper. Thank you for the pointer to this. I’ll add a note about it (to the original on the FM website). You can not change the past or learn from the future . . . with a possible exception of some changes to the past. Can you explain that? It’s backwards from the usually goal: we seek to learn from the past in order to “change” the future. The past is a constructed narrative. The future has the same problem. This is why Tonyb’s clear headed, rational, histories (above) fall on so many deaf ears. And why Politifact ignored Judith. do any of the outlier ‘optimist’ contrarian economists like Tol even try to put price tags on events like reef loss? pretty sure that’s ‘consistent with’ every one of the RCP scenarios, given it’s already directly observed. Even if ocean acidification would completely destroy the Great Barrier Reef, which it will not, then the impact on the global tourism industry is small. Even the Australian tourism industry is unlikely to take a big hit, as capital and labour in tourism are rather mobile. The more likely scenario, however, is that local tourist operators will preserve that bit of the Great Barrier Reef that attracts tourists. I guess he doesn’t explicitly place a price tag, but it certainly appears that he doesn’t value it highly. I’d quite like to know how Richard thinks climate change can manifest itself other than through changes to weather events. Maybe I’m missing something, but I don’t think we expect there to be events that we would call “climate” rather than “weather”. On the other hand, we do expect climate change to influence the frequency and intensity of weather events. The authors calculate damage from unexpected weather events and apply it to climate change — which manifests itself over decades. This allows time for preparation for such things as higher sea levels, more intense storms — so that the level of damage from weather events might remain constant (i.e., limited to levels for which preparation is not economically justified). Follow-up — for a much longer and clearer explanation of Tol’s point see Matthew E. Kahn‘s (Prof Econ at USC) “Climate Change Adaptation Economics Must Confront the Lucas Critique.” This brief excerpt describes but can not explain his analysis. Links to Wikipedia added. Of course you think I’m missing something (would remarkable if you didn’t). However, you’re still not really explaining the distinction. Climate change (as the term implies) is a change to the climate, which is really a change to the average of the weather. There’s not really some kind of event that we would regard as a climate event, rather than a weather event. Suggesting that weather shocks are somehow not related to climate change seems a rather bizarre distinction. There may be some for which there will be little change, but that’s rather beside the point. FWIW, I still find it bizarre – given how you choose to engage – that you’re still going around complaining about the broken climate change debate. Maybe you could try setting some kind of example as to how you think it should be conducted? This is a classic exchange illustrating factual statements and consensus enforcement. The Editor points out something ATTP overlooked. He then complains about The Editor’s style. When the facts aren’t on your side, argue the “tone.” Classic. In fact, the critique of the new paper offered here seems rather reasonable and based on facts and expert opinion. I certainly can’t explain it more clearly than Professors Tol or Kahn, If Kahn’s simple explanation of the Lucas Critique is not clear to you, I suggest you email one of them. I’ll bet that they’ll be happy to explain. It’s a basic and well developed concept in economics. My apologies, I didn’t reply seriously to your last point. As usual, my objection to your comments is about facts. I don’t care how people in the climate policy debate “engage”. My experience in finance and public policy — and with academics — has been mostly with “no holds barred” debate. Suitable for high stakes issues. My objections to how the public policy debate about climate change concerns methodology, and are explained here: How we broke the climate change debates. Lessons learned for the future. I understand what you’re illustrating, but it doesn’t really seem consistent with what Richard appears to be suggesting. Maybe he was misquoted, but distinguishing between climate change and weathershocks seems a little odd. As far as your broken climate policy debate goes, your suggestion seems remarkably one-sided and promotes a number of rather poor “skeptic” talking points. I don’t think the way to fix a supposedly broken policy debate is to give more credence to things that most regard as wrong, or irrelevant. Fabio and Ken – what an adorable couple. But it is not about science guys – and models can never provide the answers you are looking for. world’s growing population are adequately met. ‘Adequacy’ means energy that is simultaneously accessible, secure and low-cost. 3) to ensure that our societies are adequately equipped to withstand the risks and dangers that come from all the vagaries of climate, whatever may be their cause. It seems obvious that the smart money is elsewhere – you guys are far too late. The policy reset button has been pressed by other people in other places. All the science – all the antics of small coteries of climate warriors in the blogosphere – all the red teams and blue team – all the damage functions and quibbling about minutiae – all the dogmatic science by assertion – it is all redundant. (1) “I understand what you’re illustrating, but it doesn’t really seem consistent with what Richard appears to be suggesting. That’s quite vague. What is not consistent, and why? I don’t know why you’re replaying the tape. If Richard did mean what you suggest he meant, then that wasn’t obvious from what he said. This is, however, not a big deal. It was just a comment. Note: you are discussing my beliefs about the climate change policy debate. Yes, I realise. I’m simply suggesting that your views appear very one-sided and include a number of what are politely referred to as “skeptic” talking points. I might suggest that you expand the range of people from whom you develop your views. You’re, of course, free to not do so, but if you were genuinely interested in positively influence the climate change policy debate, you might at least consider it. Editor, ATTP’s last comment here is deceptive. After “engaging” here if I can use the term very loosely, he called you a “Delayer” on his own website and there is a conversation there about this post. Your post and comments here seem to be fact based, at least to me. In fact, it has been rather difficult for me to see much real content to what ATTP has said here. Perhaps he was just disconcerted that someone had challenged a paper whose implications he liked. In fact, the whole “climate communication” genre has obviously failed in achieving its goals (as you rightly say). It is those who are part of that “profession” (once again I use the term very loosely) who are clearly at fault. Or perhaps their goals are completely unrealistic and unachievable. Whatever the root cause, it is not those to whom the communication is aimed who should be blamed. Grown ups take responsibility for success or failure of their endeavors. It’s not kenny’s fault that he is deceptive. Self-righteous ideologues lack the necessary self-awareness to form the intent to deceive. Old legal principle found in the English Common Law. They will use it, when they go on trial for incessantly annoying decent folk. ATTP responses deserve close attention as an unusually clear example of why the campaign has failed to convince the public to rank climate change high among America’s national priorities. He debates as in formal debates in high school and college. When challenged, he frequently replies by ignoring what I said and making new claims. His other major tactic is misstating my views. Look at this thread! ATTP: Tol’s statement looks wrong or difficult to understand. I give a link to a fuller explanation by another Prof of Economics. I say that I can’t explain it more clearly than those professors. I suggested he contact them. I also give a link to Wikipedia. ATTP: You complain about how people engage in the climate change debate (no example given). I say that I don’t. The post says that the public policy debate is broken, “failing to provide the transparency and level of evidence proportional to the magnitude of the solutions proposed.” I give a link describing that in more detail, and another link with solutions. ATTP repeats that he doesn’t understand Tol’s point, doesn’t mention the explanation of the other professor I cited, and makes another false claim about my beliefs (again no explanation or evidence given). It’s typical that ATTP takes the discussion to his website, shadow boxes, and declares victory to his fans. No surprise that 29 years of such tactics have failed to produce results. As they say in AA and NA: insanity is repeating the same behaviors but expecting different results. It’s sad to watch. 1. All I said was that if Richard was indeed trying to say what you suggest he was trying to say, then that wasn’t obvious from what he initially said. I didn’t say that I don’t understand it. I said it doesn’t appear to be the same point as you’re claiming he’s making. 2. It’s rather odd that you claim that I mistate your views, since I don’t think I’ve attempted to state your views. I suggested that your arguments about the broken climate change policy debate is one-sided and repeats a number of “skeptic” talking points. This is not me stating your views; it is me stating my views about your views. Ignore this (as you almost certainly will) because it’s probably easier to do so and go around being sad than to actually think about it a little more. Anyway, this went as expected. Kudos. Fab’s got you exasperated, kenny. Invite him to take it up on your blog, then you can ban him. I just looked into your place to see if it was still lonely. WTF has happened to your sidekick willito? That post about his love for the current regime that is destroying Venezuela is bizarre. He doesn’t get that crazy over here. You are a bad influence on the boy. It’s always fun to read articles about the damage from climate change, then see at the bottom mention of factors as large or even larger — but not as trendy! Pollution, dredging, invasive species, destructive and overfishing have all been documented as having large effects on reefs — now reaching cumulative disastrous levels after decades. But down the memory hole because they’re not politically useful! Also note that severe bleaching episodes have occurred before, along with predictions that the reefs affected were dead dead dead. But they recovered. But dynamite and poison are forever. Here is an example of the best reporting we get from the major media about such things — paragraphs about the effects of global warming on the reefs, with mention of other large anthropogenic effects at the end. Journalists call it burying the lede. But at least it gives due mention of other factors, perhaps because the author used to work for coral biologist Nancy Knowlton. There’s also the studies that show the coral reefs are being killed by sunscreen, no doubt worn by people monitoring the coral reefs for damage from climate change. I think a good test of the theory would be to compare the conditions of coral reefs in the middle of nowhere (no tourism, no fishing) to coral reefs at extremely popular sites. I would point out that coral evolved when CO2 levels were staggeringly higher and oceans were far warmer. I’m living on coral laid down hundreds of millions of years ago in such conditions. This seems to be just ignoring the information we have. Of course, yes all these stresses are well documented, and these factors were dominant causes of reef stress in late 20th century. But the mass bleaching and mortality happening (and dominating reef impact) now is specifically from heat stress, quite clear both from physiological understanding of bleaching and the fact that bleach severity / mortality overlaps so clearly with SSTs. The same reef experts, monitoring organizations etc. will tell you both of these things. Actually reef experts consider them more of a modern phenom. You can clearly see the progression of mass bleaching/mortality severity over time as temps increase. E.g. ~same El Nino strength 1998 and 2016, but mortality in 1998 <5% and approaching 50% in latest (which has extended thru ENSO Neutral conditions into 2017). It sounds like your main answer to the economic issue (how do you value coral reef decline?) is disbelief that this is happening as documented/described. Bleaching is of course temperature related in some instances – the result of EL Nino in the GBR. There was some 5% mortality ultimately after the 1998 bleaching – and a similar percentage will die from the 2016 bleaching. Those areas will recolonise – and may recolonise with species adapted to warmer conditions or with species of zooxanthellae that better survive warmer water. El Nino intensity and frequency is peaking in a 1000 year high and the reef will ultimately survive this – and more – as it has before. El Nino has been much more intense in the past – and global warming is a blip. The Conversation is a great source of nonsense. The reality of acidification is that Southern Ocean water may be undersaturated in argonite by the turn of the century. The dynamics in coastal waters is somewhat different given the presence of immense sources of deposited calcium carbonate. The reef has a north to south orientation. It is far from static. Northern sections in Papua New Guinea are stable as is the southern section. Organisms are free to migrate as coral spawn – and indeed may be recolonised after bleaching during EL Nino with more heat tolerant zooxanthellae. Most corals recover from bleaching. There may be long term relief in the reversion – after a 1000 year peak in El Nino intensity and frequency – to a more normal La Nina dominant state. The bigger pressure on the reef is Crown of Thorns starfish – which is being managed with runoff control and control by divers. All very expensive. The reports of the demise of the reef have been much exaggerated. At least we may hope so. We will easily meet the Paris commitment by a variety of methods – we have about 8% wind and solar and 8% hydro – we are investing in energy research and development. Anything more is neo-socialist hipster nonsense aimed at economic sabotage. This is ad hom fallacy, obviously. The discussion in the article and my comment, regarding mass coral bleaching and mortality, is about thermal stress / ocean heat, not acidification (only incidentally related in terms of possible impact on regrowth). It’s a nice trick to flag within four words of your response that you are not following the topic or discussion. Your comment “a similar [5%] percentage will die from the 2016 bleaching” isn’t what has happened here on earth 1. Adding in the continuing damage in 2017 (under ENSO Neutral), National Coral Bleaching Taskforce’s working estimate is 50% from the two years. In general your comment isn’t related to the questions raised or factually accurate. The Conversation is unreliable source of information – as are most blogs of any kind. It is an assessment of a open resource. I have insulted The Conversation? You’re joking right? Acidification relates to a paragraph from Tol introduced by ATTP. 5% was the mortality rate from 1998 bleaching. We are still waiting on final results for 2016/2017. The bleaching occurs when corals expelling zooxanthellae – but this is not mortality. Recovery occurs with recolonisation – and most corals recover. 2016/2017 saw the emergence of a La Nina Modoki. A cool pool in the central Pacific, a double Walker Cell and warm water of both sides of the Pacific. Leading to massive floods in Queensland and California. The reporting of bleaching in this event was massively misguided lacking the benefits of surveys that would inject some reality into the public frenzy. “The Great Barrier Reef has lost half its coral cover in the last 27 years. The loss was due to storm damage (48%), crown of thorns starfish (42%), and bleaching (10%) according to a new study published in the Proceedings of the National Academy of Sciences today by researchers from the Australian Institute of Marine Science (AIMS) in Townsville and the University of Wollongong. “We can’t stop the storms but, perhaps we can stop the starfish. If we can, then the Reef will have more opportunity to adapt to the challenges of rising sea temperatures and ocean acidification”, says John Gunn, CEO of AIMS. “This finding is based on the most comprehensive reef monitoring program in the world. The program started broadscale surveillance of more than 100 reefs in 1985 and from 1993 it has incorporated more detailed annual surveys of 47 reefs,” says one of the program’s original creators, Dr Peter Doherty, Research Fellow at AIMS. “Our researchers have spent more than 2,700 days at sea and we’ve invested in the order of $50 million in this monitoring program,” he says. The irony is that La Nina bring more storms and cyclones to the Queensland coast. Nor are we remiss in installing runoff controls and painstakingly hand harvesting Crown of Thorns starfish. We have spent $2 billion on landscape management in the past couple of years alone – contracting at the same time the sequestration of 200 million tonnes of carbon. Among other things this funnels resources into indigenous communities who own 30% of the continent. I am an environmental scientist who has dived and snorkeled corals for decades. I specialise in biogeochemical cycling. I have worked on water quality in the GBR lagoon and coral and ecosystem responses for decades. You are a global warming activist who has bought into the moral panic expressed by 24 hour news cycle publications. I think you have a very shallow appreciation of the ecology of the system. But that won’t stop you – it is seems more about politics than science. I care more about science – and global warming is a blip that is easily solved. It may take a few decades – it may be quicker. My short response is to tell you are unpleasant and ill-informed and to mind your own freaking business. All those reef studies are based on RCP8.5, therefore they are useless. I studied chemical oceanography several decades ago, but I recall that reef species adapt to changes in water temperature and pH quite rapidly over a very short distance. In some cases the reef critters in some sites of a lagoon can experience very different conditions, and as the atoll changes shape the populations weave back and forth. Not so, much more severe with 8.5 but lots of reef loss projected under all scenarios. Not a big shock given that we already see such immense negative impact. “Coral reefs are projected to undergo long-term degradation by 2020 to 2100 relative to the 2000s under RCP 2.6, 4.5 and 8.5 or their equivalent”. Yes, there is a lot of unknowns about total species response, adaptability. See chaps 6 and 30 of wgII. For the most part reality is answering the question through the extreme mortality observed and trend in cover. I did not say it was “obvious”, Rather I pointed to an article by another econ prof who explained Tol’s point in more detail (which you have ignored). Yet another vague statement. Some examples or specific rebuttals would provide support for your assertion and a basis for a reply. Kenny, how about a reprise on your wet bulb fantasy? Amazing how a professor of physics can spout such ridiculous nonsense. Sad to see a scientist speaking speculatively with total confidence and w/o noting the lack of supporting evidence for such a confident conclusion. People may or may not adjust their behavior in response to climate change, and they may or may not do so on a time scale that mitigates extreme harm. There is a great deal of evidence that what “people” would adjust to depends on many factors… It isn’t such a simplistic mechanism as Richard suggests. And here I was just talking about neo-socialist hipster nonsense. I’m a Kentucky caver. You see, my ancestors always knew this interglacial was just a freak bout of warm weather, so we’ve been keeping up with the best cave locations for when it ends. I’m just hoping the genetic engineers manage to clone some mammoths in time, because those were some tasty critters. This whole civilization thing was just a fad. I live on the central Queensland coast – on the Tropic of Capricorn. . Pretty much the sweet spot for either warming or cooling. I will just have to tool up to repel the refugees. A couple of metres sea level rise and I will have an ocean frontage. We can pretty much grow anything – including coffee and spices. I am planning on going into emu farming and then franchise deep fried emu restaurants with my own secret 12 herbs and spices recipe. Just doing my part to reboot civilization. .
You can grow anything except tobacco. I had a friend in Queensland who was a moonshiner, and he kept complaining about cigarette prices. I told him to grow his own, and he wouldn’t even contemplate it. I told him that tobacco plants would fit right in to his lush landscape and nobody would even notice them, and he said he’d rather get caught driving a pickup truck full of weed than harboring an illegal patch of tobacco, because the government has their funding priorities. Tobacco is 2 years in jail and/or an $85,000 fine. Claim the weed is for back pain and you could probably get away with a warning. Whiskey class, $550,000, 1050 tons surface, range 12,000 – 15,000 miles. At $20 profit per pack, just replacing 12 torpedoes and 4 SSN-3 cruise missiles, by volume, plus using the torpedo tubes as extra storage, equals the submarine’s purchase price in just one run. This is probably not lost on corrupt officers in the People’s Liberation Army Navy, or smugglers anywhere. If you didn’t have organized crime before, you certainly will now! Oh, and I would suggest using a pea-shooter to spit tobacco seeds into Turnbull’s back yard, and then calling the law when something sprouts. In fact, I would do that to all the MP’s. But where will I put my emos? Ah emus…. emos need to toughen the fu.k up. I have never seen you ma key this argument when it is suggested that people will migrate ..adjust their behavior. 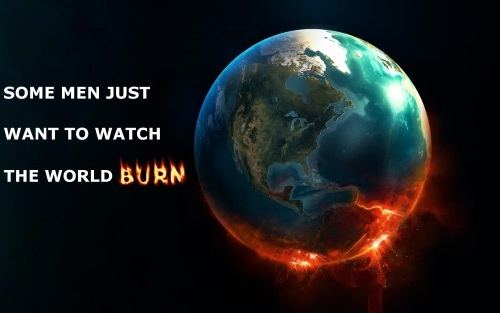 Show the evidence that global warming would cause any harm, let alone extreme harm. Not appeals to authority – show the evidence! There is solid evidence that people adjust to their climate. Just look at the housing and clothing people wear in the tropics compared with at high latitudes. Compare northern and southern regions of the USA. Krummer ==> Thank you — you’ve saved me from the effort of writing about Hsiang et al. You left out that Hsiang et al actually think there is a causal relationship bewteen Surface Air Temperature and crime — both crime against persons and property crimes. Fruit-cakery a its finest! Of course there is. That’s why the muggings, shootings, burglaries, and rapes all happen in the early afternoon, around 2 PM. Oh wait, they happen at night. Yup. That’s based on actual empirical data. Mosher ==> Please, provide a link to anything (anything at all) that is “empirical evidence” of a CAUSAL relationship between “surface air temperature” and “crimes against persons and property crimes”. Don’t require me to drag real statisticians in here to disabuse you of the idea — which, btw, is simply nutty — fruit-cakery — and entirely unscientific. Riahi et al does refer to BAU, but it and the accompany van Vuuren ‘The representative concentration pathways: an overview’, make it clear that this is at the ’90th percentile’/’conservative’/’high emissions’ end of the baseline (aka ‘no climate policy’ or BAU) scenario. It is this that the industry has buried. van Vuuren also suggests RCP6 is approximately the baseline/no climate policy scenario, and the majority of the scenarios in the literature identified in AR4 were around RCP4.5. RCP8.5 is what you get if you defund renewable energy and increase coal. Not very realistic unless the world Trumpifies. No, demographics are much more significant. But it does point out the vested interest of wind and solar companies. But here’s a fun aspect. 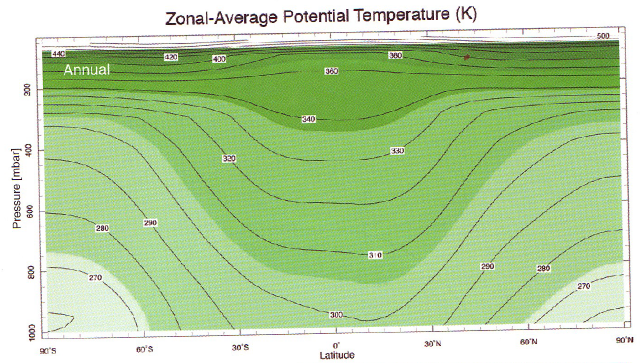 In Figure 1H, the authors demonstrate hypothetical electricity use with temperature. A big part of that is air conditioners, almost all of which use electricity. But they neglect to indicate total energy use, which is higher in winter than in summer, even with air conditioner use and increased driving. And heaters run on burning natural gas/coal/oil and very little on electricity. So, renewables can be used for increased air conditioning of increased heat. But renewables can’t be used for increased fossil fuel load of heating in winter! So, for renewable energy use to be most effective, it requires warming! Their supplementary information about the energy model NEMS, also used by the EIA, shows that they account for all energy. No, you miss the point, RCP6.0 is what you get with no intervention. RCP8.5 is what you get if you assume no change in policy and then you take the 90th percentile for your assumptions within that. It is unclear what that means for the joint probability for the full assumption set, but will almost certainly be much less than 10%. (1) I don’t know how to estimate the odds that the current acceleration in tech (esp energy tech) will stall during the next 8 decades, but I’ll bet that it is far smaller than 10%. (2) The UN population forecasts are a pure exercise in probability. Many demographers have pointed out that the higher outcomes are extraordinarily unlikely. For example, Africa will have to modernize to sustain a 4x increase in population — but without the fertility collapse that has accompanied such development everywhere else. I don’t know the odds of that happening, but I’ll bet that they are far smaller than 10%. (3) What are the odds of BOTH (1) and (2) happening? My guess: very small. To get to their population of 12 billion by 2100, you only need a growth rate of just under 0.7% per year, which is half the rate of the last century. It is not far-fetched because it is a significant reduction in growth rate. Such linear extrapolations are seldom right in the social sciences. Much of the world already has fertility below replacement level. Fertility rates in most other nations are falling. The problem is, annual rates of forcing peaked in 1989. 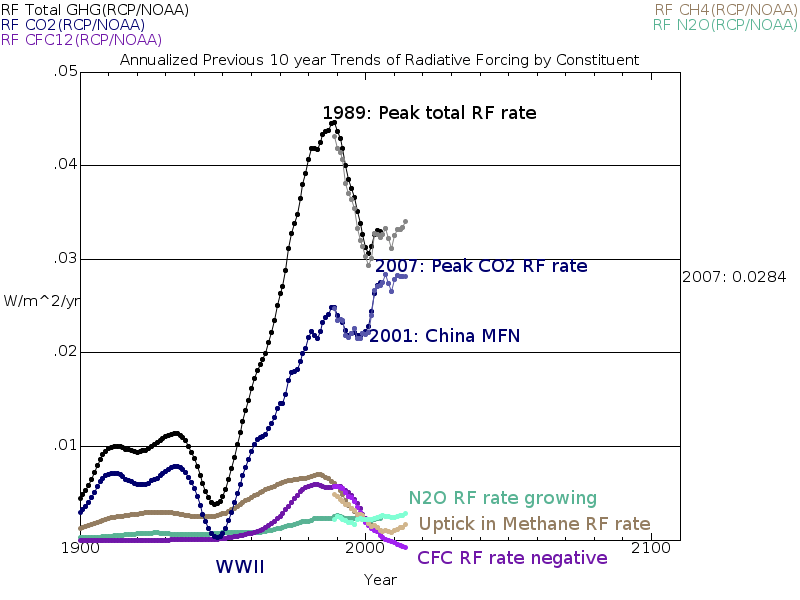 If you believe, as I do, that radiative forcing tends to cause global mean temperature increase, then it is a contradiction to believe that future rates of warming will be higher when increases of radiative forcing are slower than they were in the past. I should make clear that my comments were directed simply at what the literature says, rather than how realistic that might be. The point is that that literature in itself is unhelpful to the chicken littles. TE, that seems wrong because the CO2 change rate has grown 50% since 1989 while total CO2 has grown nearly 20%. From CO2 alone the forcing rate would therefore be 30% larger than in 1989. Once you call it “business as usual” you are committing fraud. It can be argued it’s a criminal offense to use such a designation, since it’s used to back subsidies, taxes, and favor some commercial interests over others. This is why the EPA work used to establish their damage function (a case that’s even more fraudulent than RCP8.5) needs a thorough review by a team that’s not associated to either the corrupt Obama faction or their cornucopian “there’s plenty to burn” opponents. We need serious work by serious people on this core issue immediately. You could attribute this mostly to the flattening of the still rising CH4. Today the forcing increase rate from CO2 is 0.033 W/m2/yr (0.04 if you consider 3 ppm added in 2016) which is the highest it has been and that rate has accelerated 30% since 1989. Turning this around is the main problem that still exists. I mean not just reducing the growth rate, but limiting the level of CO2 well below 500 ppm, which is a different prospect entirely. With the EPA rolling back methane restrictions or reporting, I don’t hold out much hope for that part either. Thanks. They will add a 7 W/m2 scenario to the BAU set. This appears to have emission rates doubling and also CO2 levels doubling to around 800 ppm by 2100. 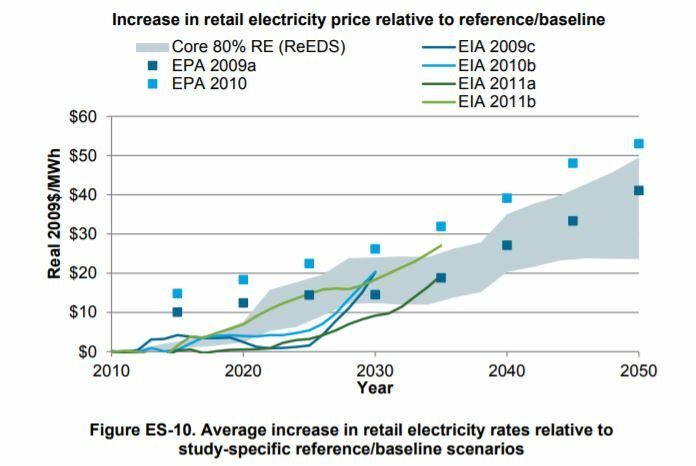 The cost of an 80% renewable penetration strategy by 2050 is a 25-50% increase in retail electricity prices above the baseline. We could run some numbers – but this is a pretty big hit. Jimmy wants to tax the rich and pay the poor to pay for this. But wait a second – if you have 80% renewables and 20% nuclear – there isn’t any carbon tax revenue and so the poor are just sh.t out of luck. As we say in Australia – sh.t happens. You might want to rethink this. Thank you. Very interesting post. Climate change is real … . It’s as meaningless as saying the tide is real. I’ve written several thousand posts. I’ve found that complexity of language is a barrier to understanding when addressing a general audience, and it is possible to communicate only a few simple concepts in a single article. Perhaps the most common critique is that I didn’t discuss this or that factor, or state something with sufficient precision. I’d like to see posts by these critics. I suspect they would have a small audience. And an ever smaller number of people who were influenced by them. Apologies. I didn’t mean to offend. My apologies if I gave that impression! I was just explaining the constraints that authors have when writing. Accuracy and precision mean longer-winded explanations, which fewer read. For example — I used to carefully bracket statements with qualifiers (e.g., possibly, perhaps). My editor said to lose the modifiers. Sensible people understand that most statements have such embeded in them, and they make text heavy as lead. I’m a huge fan of framing. OK. Thank you. I accept all that. However, I do still believe it is misleading to say “climate change is real” What is meant is that climate change is constant and humans are having an impact; however we do no know if GW is overall beneficial or damaging. I really think that message needs to be got across, not just say climate change is real. Because to most people that just supports the belief that climate change is due to human activities and it is dangerous. Your’s is a good post and I do not what to argue with you on this point on your thread. Alarmists control the language to control the discussion. Thank you for the suggestion! I’ll change my text (at the FM website) and use that from now on. These things often are blindingly obvious — once someone points them out to me! 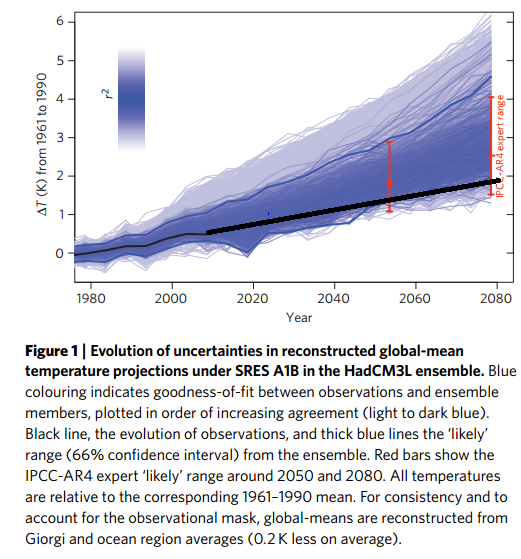 This doesn’t actually help any framing, because it still seems to intentionally obfuscate the interesting question, whether you are starting from a position of general acceptance of the mainstream view on anthropogenic climate change across disciplines (as expressed in IPCC, national academy summaries etc.) or not. Obviously you are not consistently doing so, so essentially all other discussions (about policy, economics etc.) are somewhat pointless because you are talking about what to do with two different earths. Your (and Richard’s) outlying views on coral underscore this problem, for example. More clear framing – e.g. “as a lukewarmer, I have what I believe is a nuanced view on the strength of the findings of mainstream climate science regarding anthropogenic greenhouse-driven warming and associated claims of climate change. Some aspects of this I believe are supported and some I believe are uncritically overhyped or exaggerated both in the scientific literature and in the media” would seem a more helpful framing. Then you can focus discussion on what needs to be discussed – the things you find under-supported in some scientific case or another (or the things you find to have merit in the contrarian case that are not generally accepted in mainstream science), vs. seemingly pointless discussions of policy that are based on fundamentally different assessments of physical reality. My thanks to you all, from Peter onwards. This is helping a great deal. That’s an excellent and brief framing, and far better than I gave in this post. I agree in general with the AGW situation as expressed by the IPCC. I wasn’t too keen on their attempt to do regional projections. Their mortality from heat looks a bit sketchy…no time to check it. Still there are intrinsically difficult ideas. One of these is the notion of determinism and randomness itself. To be replaced by functional definitions of predictability and unpredictability respectively. “Here I argue that the dominant dichotomous logic reflects a naive and inconsistent view of randomness. It cannot help us see the unity of Nature. Are the movement of planets and that of dice qualitatively different natural phenomena? Being a preamble to the necessity of reviewing even such long established notions in science. Science being not mere rote repetition of definitions but a quest for uberty* in realizations. Earlier we saw weather defined as unpredictable and climate as predictable. This turns the wisdom of scale on it’s head. Weather is predictable for a week or so – initialised and nested models at different scales may be able to integrate weather into short term climate prediction. Conventional definitions of climate as the statistics of weather notwithstanding – this comes at things from a bottom up process orientation – albeit that we still have much to learn about processes. famously Nile River flows over a millennia – that are more unpredictable than a random time series would be. “Unlike common random series like those observed, for example, in games of chance, hydrologic (and other geophysical) time series have some structure, that is, consecutive values of hydrologic time series depend on each other. A special kind of dependence observed on large timescales was discovered by Hurst half a century ago and has been known by several names such as long-range dependence, long-term persistence, or simply the Hurst phenomenon. Since then, it has been verified that this behavior is almost omnipresent in several processes in nature (e.g., hydrology), technology (e.g., computer networks), and society (e.g., economics). The consequences of this behavior are very significant because it increases dramatically the uncertainty of the related processes. However, even today its importance and its consequences are not widely understood or are ignored, its nature is regarded as difficult to understand, and its reproduction in hydrologic simulation is considered a hard task or not necessary.” Koutsoyiannis, D. 2005. Hydrologic Persistence and The Hurst Phenomenon. Water Encyclopedia. 3:210–221. So what are these mysterious, persistent, non-random, self- clouding (in the sense of Jimmy D) processes in weather and where do they originate? It is indeed a difficult idea. Thanks for that, especially the link on hypothesis testing. It was enjoyable for me similar to an RG Brown muse.. Like the comfort of a warm bath, you can let it soak in as you soak in it. Never gets old just letting it roll around a little bit. Great science is an aesthetic experience as much as a poem or a painting. Sometimes there is the thrill of recognition – sometimes it unfolds like a lotus in the mind over decades. Lets accept the premise. 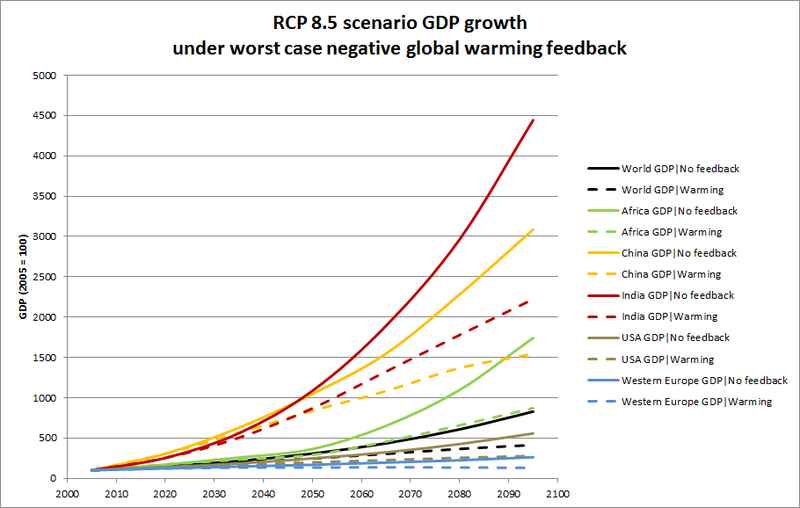 RCP 8.5 type temperature scenarios will cause damages that amount to 1-1.2% of GDP on an annual basis per 1C of temperature increase from their 1980-2010 baseline. to Mitigate climate damages. You’re not gunna pay 1% of GDP to avert damages that amount to 1% of GDP. While folks have characterized RCP 8.5 as BAU, it clear that it is really a worse case, boundary case. We know things will not be as bad as 8.5. Since they have the data for other RCPs it might be more interesting to see how those RCP turn out. Finally, it would also be interesting to see what happens if you use more reasonable assumptions. Also, the High risk labor that is impacted ( too hot to work outside) is labor that may be entirely GONE in the coming decades as we deploy robots to do things like construction. In short you dont have to do much..
And you will find climate related damages that are CONCERNING, but not alarming, and you will find that the choices between mitigation and adaptation are more interesting.. In short, better preparation for the weather of the past will go a long way to reduce future damages. Call it infrastructure spending. I would not fight this paper. I’d embrace it, but make a few tweaks, and you’d take 3/4ths of the sting out of it. At that point it becomes clearer that the first step is to prepare for the weather of the past, at least. And take mitigation steps ( more NG versus coal, reduce Black carbon, Promote Nukes) that you would do even IF there were no climate problem. The possible damages from a reasonable scenario (RCP 6) indicate some reason for Concern not Alarm, and there are rational cost effective ways to prepare for these changes and rational ways to mitigate that are potentially economically beneficial. I agree. This Hsiang et al. paper is an overall wonderful paper. People in these comments are focusing too much on the inputs into the study, as opposed to the overall methodology used to take all these inputs and generate its damage functions. Yes, that’s true of the comments. But the economists’ critiques I cited were of the study’s methodology. A side note: my post was written from a public policy perspective, where the inputs and conclusions are as important as the methodology. how to flip the script. Witness what Nic Lewis did with the Energy Balance approach to estimating ECS. he ACCEPTED the methods and then improved them and worked hard to understand the inputs. In general I have been arguing for this approach since 2007. There is enough uncertainty INSIDE THE SCIENCE to work from Within to achieve a result that is both good for the planet, the poor, and economies in general. If you write your comment up, I’ll post it. It’s a better analysis than mine! I use your comment about that in this post and in many other posts. IMO it should be the opening sentence in every report about the public policy response to climate change. I appreciate that. Unfortunately I am spending so much time on planes and in hotels and in meetings that I can only grab a few minutes here and there to comment. That $7.4M value for a human life would seem to argue against birth control. Do the abortion without limits proponents know about this? The greenie-lefties seem to be confused. Do we have too many people, or not enough? You are blabbering incoherently. And you seem to believe that the only possible objection to abortion without limits is based on religion. I won’t trigger any more of your irrational foolishness. Talk to your chimps and cows about it. If you play it right, they will nods their heads and you can take that as validation. Out of curiosity, so that I can know for future comments, were my comments on abortion removed because pro-abortion comments are not allowed in general or because they are off-topic? Did you notice she also removed some of my comments? The victim card won’t work here. Grow up. Don, I just want to know why so that I can respect the rules of this site in the future. It might help your case if you expressed views that indicated you have more reverence for the human species than you do for zoo and barnyard animals. There’s no peer review in climate science. Climate science is a social structure. 1. Navier Stokes equations, can’t solve. Notice it’s what you might call a tiny piece of climate science. Tiny pieces are all you can do as science. They don’t go together into a science of climate. The latter is a social structure, not a science structure. The graphics indicate that they are running the warming up to 8 degrees C, which is absurd, but an easy way to get damages. They have some fancy tipping points, so their “per degree of warming” numbers are meaningless. In fact mild warming looks to be beneficial. Not surprisingly, the Obama NSF and DOE helped fund this junk. Hopefully this will now stop. For their (supposedly empirical) temperature caused damage functions, it would be interesting to look at warmer versus cooler US locations to see if they hold up. My guess is not. Yes, RCP8.5 is a worst case analysis! It’s a valuable reminder of the consequences should things go badly wrong. Thanks for that observation! I didn’t see or understand that per degree of warming numbers are not similar across scenarios. Personally I think worst-case scenarios are useful (although economists differ on the best methodology for these). It is the misrepresentation of RCP8.5 that makes these pernicious — counter-productive in the public policy debate. The high temperature cases are used to establish the shape of the damage functions as quadratic. the important part of the curve ( 1-3C) has damages that are roughly linear… basically the same as previous assumptions that for small changes in T, the damages are linear in T.
Nothing can be attributed to climate, whether it’s changing or not. Climate only exists as a statistical imagination. Go try to find climate somewhere and give it a list of issues. Come back with a full report and photos. The best you can do is go to Climate Shaman Mosh with your gifts and he’ll make sure Climate is appeased. This thread is about USA costs, but some data from Australia might be relevant. Here is the analysis of Australia’s 5 main capital cities, done in 2015, with a self-evident title in the URL. It is scientifically dubious or even false, to make the claim that heatwaves there are becoming, longer, hotter, or more frequent. Logically, it would be pointless to use these data to project the costs of future heatwaves, since there is scarce evidence of any change. This is quite a thorough study, very difficult to argue against the findings, but scientific arguments and corrections are welcomed. For example look at how much CO2 is generated when fabricating and installing wind-mills. Fabrication of a Tesla battery generates 8 tons of C02, long before fossil fuels generate a bunch more charging it. Ten years hence when the batteries and windmills fail and are abandoned we’ll look back and think how short-sighted our vitual-signaling behavior was. Toxic heaps of scrap and useless blights upon the landscape will be found everywhere and we’ll learn that no dollars were set-aside for their remediation. “virtue-signalling”… darned autocorrect go me. Pingback: Weekly Climate and Energy News Roundup #276 | Watts Up With That? Imagined harm from imagined warming imagined to be caused by man. What better reason could there be for more taxes and governmental control our lives as soon as possible ?